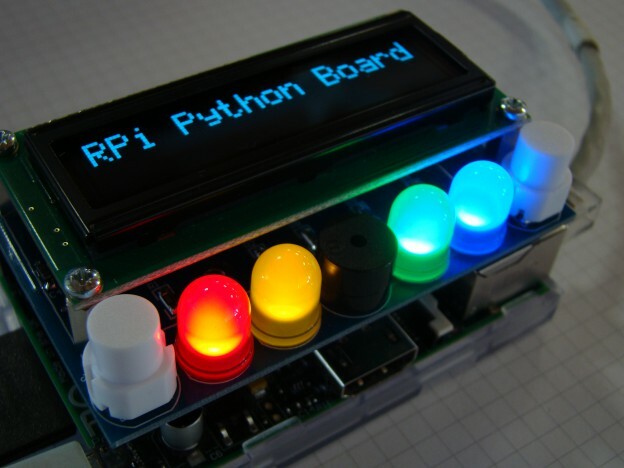 The RPi Python board is oriented for a educational environment, so the hardware is simple, and has the basic elements to start working with Python. 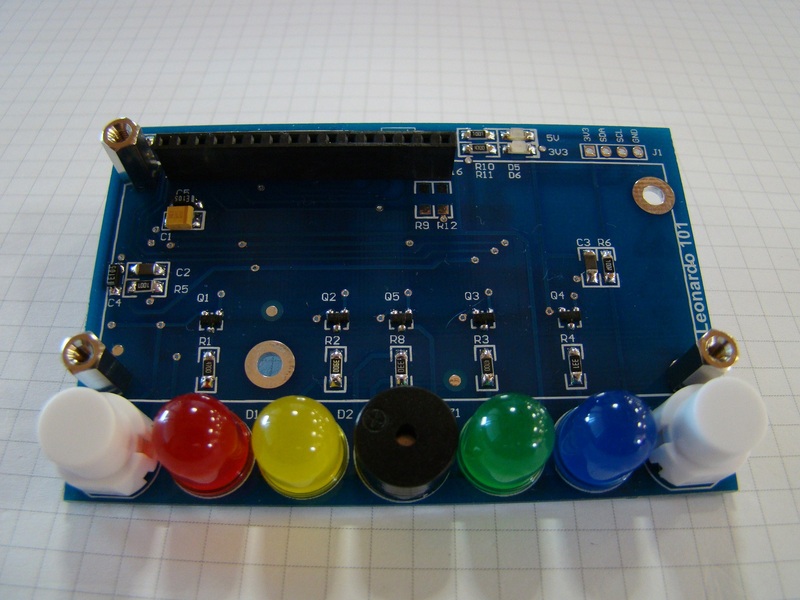 We develop this breakout board to fit in the Raspberry Pi board using the GPIO’s to control the elements. 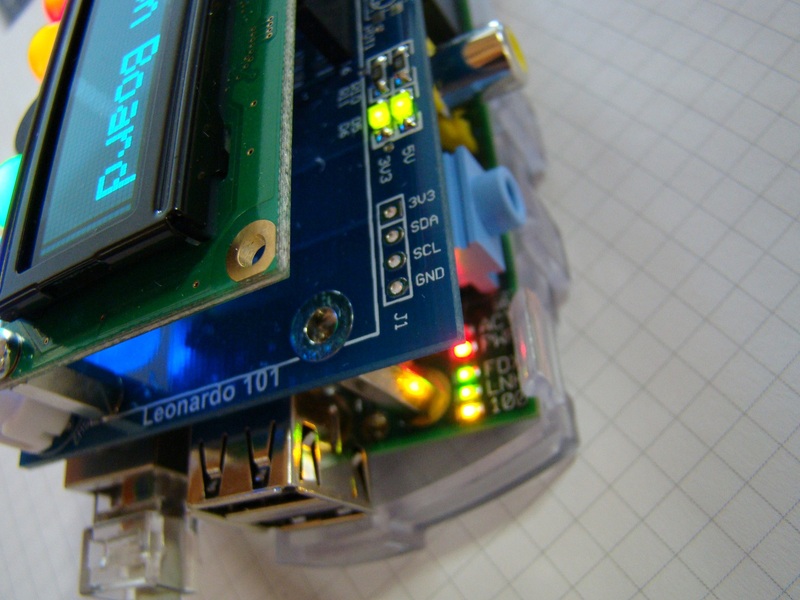 Why Raspberry Pi? Because at this time, is the cheaper and powerfull board in the market. It has a lot of documentation and support behind it, in a future post, I’ll talk about it deeper. If you want more info about the Raspberry Pi now, you can look here, here or here (this last one in Spanish). These leds are the same ones that I use previously on the K4S Keyboard. This leds are connected to a general GIPO’s of the board (see schematic) through a FDV301N mosfet transistor. These transistors are not necessary, because the current on the leds are small, but I prefer put it to protect the GPIO pins of the Raspberry. To activate, you must put the corresponding pin to HIGH, and for turn off, put the pin in LOW level. 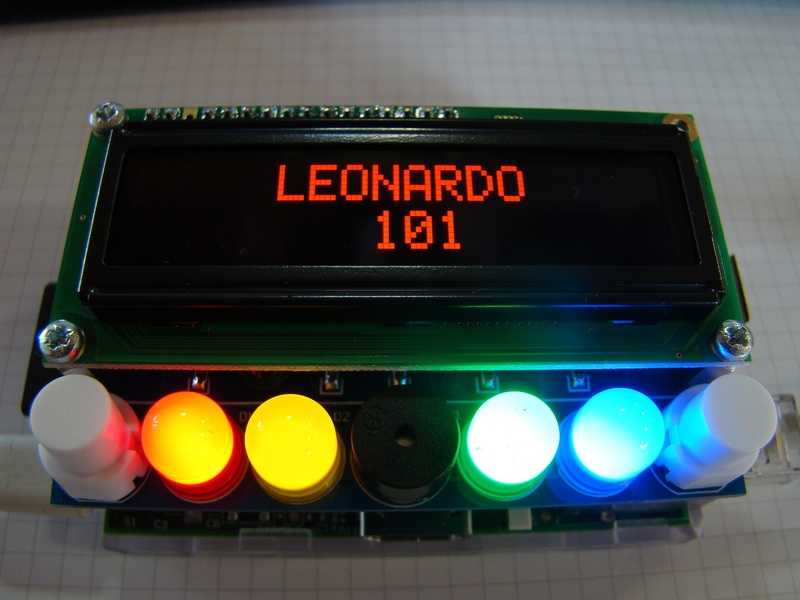 The pushbuttons allows send inputs to the Raspberry, so reading it you can know if they’re pressed or not and act according it state. By default, when the pushbutton is not pressed, you read a HIGH level, and when you press it, then you will read a LOW level. The buzzer allows you send acoustic signals. You can program a continuous tone or beeps with a variable period, it depends how you program it. Like the leds, I put a MOSFET transistor to protect the Raspberry Pi pin. To activate the buzzer, you must send a HIGH level to the pin. And to turn off, simply send a LOW level!. This connector allows to put a standar 2×16 LCD display, to send messages ans show info. 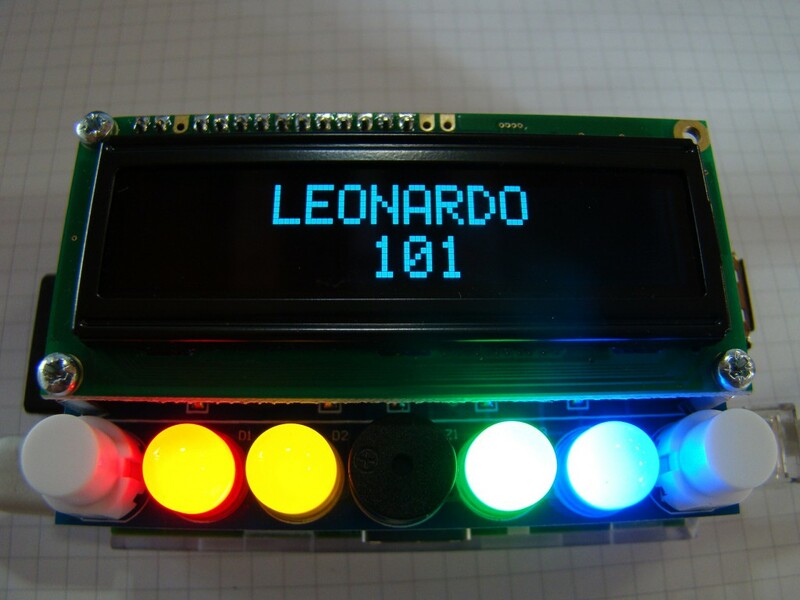 You can put a standard LCD module or an OLED one. I decide put this last ones, because are really cool and gives a modern aspect, instead or the traditional ones. And, because the OLED display makes its own light, no backlight is required. This reduces the power required to run the OLED and is why the display has such high contrast. I choose two colours, Red and Blue from Raystar, that also provides a good application note to manage these displays. 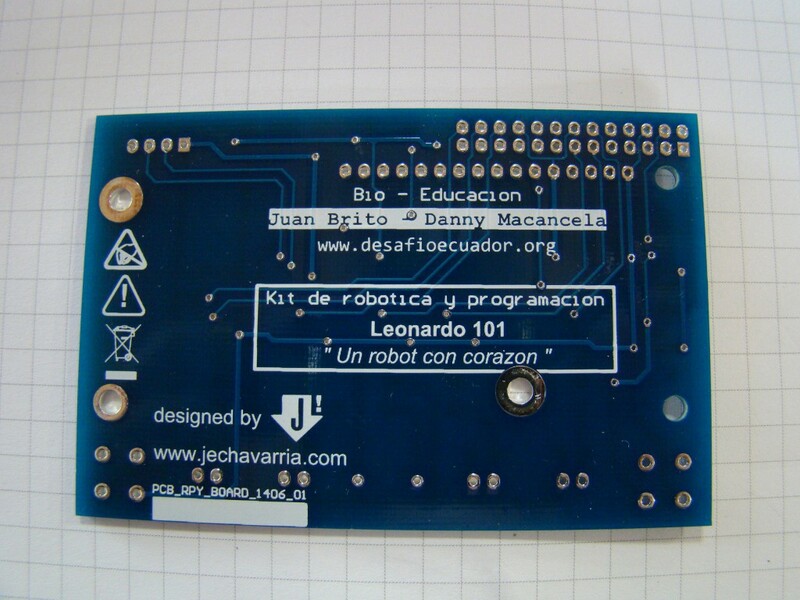 From here, I want to giving thanks to Jorge Galán, from RC Microelectrónica for his help and support to obtain it. I put a 4×1 2,54mm standard connector with the I2C signals, to allow connect external peripherals to the Raspberry. In the future, I’m sure I’ll use it! In a future entry, I’ll put the code to show messages in the OLED display, because these code is more complex and requires more technical knowledge. Are these boards available somewhere. Great project. First of all, thanks for read the blog and your interest in the project. Actually, we only have two populated prototypes. At the end of this month, we expect to have some boards in stock and have the price for it. Can you wait until then? 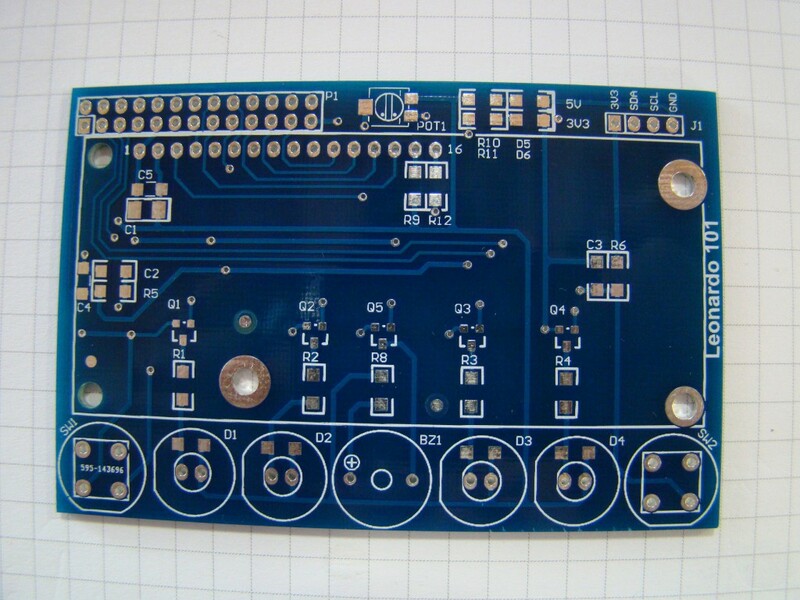 Some questions: will you interested in a blank board oor do you want a fully assemble one? And how many boards will you want / need? Thanks again and sorry for not have the boards yet, I hope the delay will not be a trouble. Please contact with me for any question or suggestion!! I’m interested in a completed board. What is the cost? Will these boards work with the B+ board variant and are/will there be left over GPIO pins to be used for other purposes? This board amalgamates the functionality I wish to have in a small project I have in mind related to the production of maple syrup temperature monitoring. Thanks for your interest in the board. Yes, I test these days and the board works fine with the B+ model. But I’m having some troubles with the OLED driver in this B+ version, I’m working on it. But it works perfect with a normal LCD display! I’m interested in these boards, specifically for both learning Python and integrating them into IoT projects in my home. Do you have an anticipated “for sale” date yet? 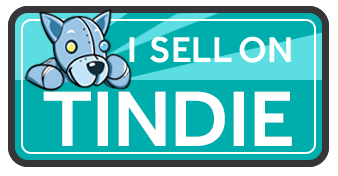 And do you plan to sell them on Tindie? Nice job! I would be very interested in at least one of these boards. Any ideas when they will be available for purchase? This is really nice. I personally think the RPi is a much better platform for learning programming because you can do more with it, using Python or Scratch. One feature request for this wonderful board – I always find that having more interesting inputs help motivate the programmers. How about adding a sound or a light (LDR) input option? This is what makes the littleRobotFriend and the PicAxe school experiment board (axe092) so nice. Hi PK! First, thanks for read the blog and your friendly comment! I just see the littleRobotFriend, and they’re lovely!! About your suggestions, I also think in these two elements for a new version of the Scratch board (and I also will include a motor driver!). Unfortunately, for the Python board these elements are difficult to integrate, because these are analog signals, and the Raspberry doesn’t include an on-board ADC. Of course, these signals can be included, but then we need an external ADC for the LRD and a DAC for the speaker, and these elements makes the code more complex. But it’s a good idea, maybe for an advanced board to program Python! Thanks again for your interest and comments!! Thanks for the explanation ! I didn’t realized there is not ADC/DAC support on the GPIO pins. Now i understand no-one put analog type I/O on the basic expansion boards, and offer i2c versions instead. Like to see you make this board work with the 18-Pin LCD so you can have RGB control.